Humans hunt and eat animals every single day. Unless you’re a vegetarian, vegan, or animal rights activist, it’s not something that even crosses our minds on a daily basis. However, these 10 stories show what happens when animals choose to strike back against their human oppressors once and for all. Apparently, female elk are “nearly impossible to kill,” because they are intelligent enough to evade hunters. Male elk are often killed for their meat and prized antlers, which people use for furniture and overpriced chandeliers . Of course, the challenge in successfully killing an elk just makes it all the more tempting for hunters, especially in the middle of states like Utah. In February 2018, a flight crew hired by the Division of Wildlife Services was attempting to net an elk in Wasatch County, Utah so they could implant a tracking device to monitor its herd, in order to make it easier for hunters to find them. This elk wasn’t going down without a fight. The pilots failed to tie its legs together before taking off. So, as the vehicle rose about 10 feet in the air, the elk kicked the rear rotor off the the helicopter. This brought it crashing down. The pilot and the crew were safe, but unfortunately, the elk did not survive the disaster. Whether the elk knew it or not, it essentially sacrificed itself for the sake of the herd. A well-known big game hunter named Theunis Botha from South Africa took high paying clients into the savanna on a regular basis. He even had a YouTube channel showing off dead lions, cheetahs, and elephants. Clearly, he was in this for the money, and had zero regard for contributing to a species’ extinction. In 2017, Theunis was in Zimbabwe with a group of clients who wanted to hunt elephants. Theunis approached the elephants, but they began to charge at him. In case you weren’t aware, elephants are actually very intelligent creatures. They never forget a face, and they have been known to take revenge. It’s possible that they recognized Theunis from past hunts or, at the very least, were able to identify a gun. As the elephants were trying to charge at Theunis, one of the men in the group was taking aim, and shot one of the female elephants. The elephant used her last moments of life to grab Theunis with her trunk so that he would be crushed by her body as she fell. African bush elephants can weigh 13,000 pounds… so Theunis Botha didn’t stand a chance. He died at 51-years-old. A farmer by the name of Lukasz in Poland was about to be send one of his cows to a slaughterhouse. The cow had other plans. When one of the farm employees approached her, she rammed into a metal fence. He attempted to grab hold of her, but she pulled so hard that it broke his arm. The cow ran, and dove into a nearby lake so it could swim to safety on a small island. Every time her owner or the local fire department would attempt to capture her, she would just jump back into the water, and swim away again. Lukasz eventually started leaving food for her on the island, to ensure that she wouldn’t starve to death. A local politician named Pawel Kukiz stepped in, and tried to save the cow from death. He called her a hero, saying that if all Polish citizens showed as much initiative as the bovine, then their country would be a better place. The cow managed to live on the island for several weeks. Lukasz found an interested buyer who wanted the cow for himself. So, it was shot with several sedatives in attempts to capture it. Sadly, it died in a truck on the way back to the farm. Apparently, it died from the sheer amount of stress it was being put under from constantly running for its life. We don’t know what it is about cows in Poland, but there is another story of a cow who escaped its farm as well. 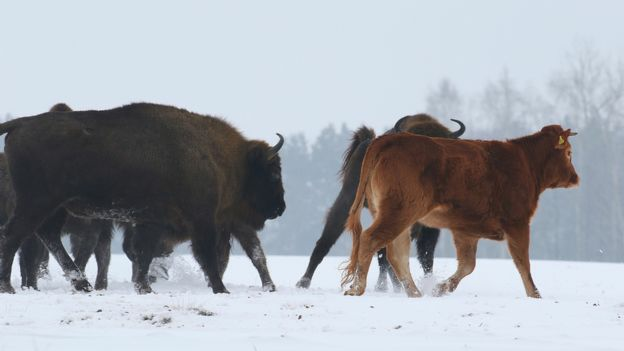 Instead of swimming to an island, this cow found refuge with a pack of wild bison in the Bialowieza Forest. In a way, it’s kind of like running away from home to live with your distant cousins, because the bison didn’t seem to mind having her around at all. In the photos, it’s clear to see that this cow is very happy and healthy in her new home. She can even keep up with the herd, despite being only half their size. However, scientists are afraid that their friendship could lead to a strange bison-cow hybrid species. So, they plan to recapture her and put her back on a farm in order to prevent that from happening. Sadly, these cows just can’t catch a break. In January 2017, several lions were found dead in South Africa’s Limpopo County. Their paws and heads were cut off by poachers who sell them to witch doctors and collectors around the world. It would seem that these lions in that area decided that they would never again fall victim to these crimes again. In February 2018, a poacher broke into a private nature reserve and attempted to kill again. The lions attacked the poacher, and ate almost his entire body. They left behind the hunter’s head, eerily echoing the beheading of their fallen brethren, and a few small body parts, which had been discovered by park employees. The man’s identity still has not been identified. A 51-year-old hunter named Robert Meilhammer was duck hunting one morning on the Miles River in Maryland, along with several other men. A flock of Canada geese flew overhead, and one of the hunters decided it was a good idea to shoot at them. Robert had to suffer the consequences of that stupid decision, because the goose came crashing down on his face. He was rendered unconscious, with two of his teeth knocked out, and suffered severe injuries. He had to be airlifted by helicopter to a nearby hospital. Most likely, this means it’s “Game Over” for Robert’s days of duck hunting, and he should probably stick to the digital version. For multiple generations, humans have been capturing animals from the wild and putting them in pet stores around the world so they can stock their aquariums with foreign species. Back in 1995, a German pet store bought crayfish from Texas. Why would anyone want a crayfish as a pet? Your guess is as good as ours. That German pet shop owner was in for the surprise of his life, when one of the crayfish had a genetic mutation that allowed it to asexually reproduce. One single crayfish can lay hundreds of eggs at a time, and this one produced only females. They are exact genetic copies of the mother, who are already equipped to fertilize their own eggs. This means it can clone itself over, and over, and over until it takes over the planet. But what did this pet shop owner do? Well, somehow, he let it escape, and a single crayfish became its own invasive species. For the past 25 years, it has continued to spread itself all over the oceans of the world. The only bright side to this is that with a never-ending supply of crayfish, fishermen should never go hungry again. Anyone who has ever dealt with a wild turkey knows that they are incredibly stupid. This is probably why they were so easy to hunt and serve on the first Thanksgiving. In a Mount Vernon, Pennsylvania neighborhood, a rogue wild turkey wandered around on its own. People noticed him alone so often that they named him “Stu,” after the charmingly dysfunctional dad from Rugrats. In late January of 2018, Stu didn’t seem to approve of a police cruiser that rolled into town, because it began to attack the vehicle. Unless you’ve lived under a rock for the past few years, you probably remember Grumpy Cat. The naturally angry feline is so adorable, it became a meme sensation virtually overnight. Grumpy Cat has sold tons of merchandise, and even starred in its own Lifetime Christmas movie. A coffee company called Grenade paid $150,000 to use Grumpy Cat’s likeness and name to sell their “grumpaccino” iced coffee drinks in 2013. However, the coffee company took it one step too far by making tons of money selling t-shirts and other merchandise with Grumpy Cat on it, as well. So, in 2015, Grumpy Cat – or rather, her owner – sued Grenade Coffee in court, and won $710,000 for copyright infringement. Alright, so this one isn’t technically the animal striking back, but considering cats are all completely evil, we all know the diabolical feline was the true mastermind behind the lawsuit. This one is more of a human (inadvertently) striking back against himself out of sheer terror, and it’s terror that makes sense. One of the most common fears among humans is arachnophobia, which is an intense hatred of spiders. Now, before you get yourself in a tizzy about including a “bug” on this list, arachnids are actually part of the animal kingdom.. In January 2018, a man in California spotted a huge spider in his apartment. Apparently, it was too big to stomp on, so he had a bright idea to pull out his lighter and set it on fire. However, not even the flames of hell could kill this spider, because it used the remainder of its strength to crawl onto a mattress, and set it on fire. The residents tried to put the fire out with a garden hose, but things only got worse. In total, the fire spread to other parts of the home, causing $11,000 in damages. Of course, the man tried to blame it on the spider. Well, that’s debatable. What’s not debatable is the fact that Yakety Sax almost certainly started playing when things went awry.